In the case of Sanskrit such work was already successfully undertaken and mastered in ancient times by grammarians like Pāṇini. The Sanskrit textbooks of today have a standardized and consistent grammar which has its roots in very ancient Indian history. 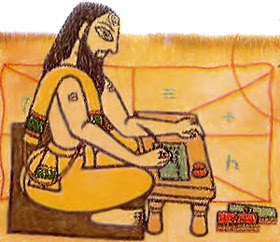 This is unlike Literary and Classical Chinese where while pre-modern character dictionaries explored the etymology of words, there was no prescribed grammar on the scale of what the Indians produced, yet still Literary Chinese was an intelligible and widespread written language in use for around two-thousand years. I asked one of my professors if the Chinese ever drafted a prescribed grammar like Pāṇini did in India. He said that they did not. How was it then that an author in pre-modern times learnt how to write correct Literary Chinese? He suggested it was really a matter of memorizing a set of standard classical texts and absorbing the grammatical conventions contained within. As history shows the methods actually worked. If writers all had a basis in the same literature, then it can be expected that they would be on the same page when it came to what constituted correct grammar, even if it was based on an instinct developed through organic absorption of the patterns within a set of canonical texts. That being said, East Asian civilization did have contact with Indian civilization and there were at least a few individuals who were exposed to the systematic Indian understanding of grammar, though such influences were perhaps not so great. Here I would like to briefly explore two things. I will examine how while Chinese linguistic tradition touched on areas of etymology and phonetics, they did it without use of grammatical terms. I would also like to take a look at some of the cases where Indian grammatical ideas were adopted in China and where there were influences from the study of Sanskrit on classical Chinese linguistics. Here a distinction needs to be made between Classical Chinese 古文 and Literary Chinese 文言文. The former should be regarded as a spoken language which was written down. In reality it is a very broad category encompassing everything from the Shang Dynasty (1600 - 1046 BCE) to the early Han Dynasty (206 BCE - 220 CE). It would include texts like the Analects of Confucius 論語 and the even older Book of Poems 詩經, which even in Confucius' time was already quite aged. There are actually a number of dialects in Classical Chinese which of course reflect the numerous actual spoken dialects in existence at the time. For example, the Analects of Confucius 論語 and Menicus 孟子 were composed in the dialect of the kingdom of Lu 魯, while Hanfeizi 韓非子 and the Book of Lord Shang 商君書 were of the Qin 秦 dialect. What distinguishes Classical Chinese is that in general it reflects the actual spoken language of the authors. In contrast to this, Literary Chinese is a written language that is to a large extent, though not entirely, based on the vocabulary and patterns of Classical Chinese. From around the Han Dynasty the written language became divorced from the spoken language and over time this common written language spread across all of East Asia, eventually being employed by Korean, Japanese and Vietnamese writers. In a future entry I will take a look at how non-Chinese authors employed Literary Chinese. Ancient Chinese linguistics did indeed include areas such as etymology, phonetics and epigraphy, but grammar itself as it was developed and understood in the Hellenic and Indic worlds where prescriptive grammar was extensively discussed and formulated, is not to be found in classical tradition of linguistics in China. In the case of Literary Chinese the reality is that there never was a prescriptive grammar, yet despite this over the centuries there was still surprising consistency and intelligibility owing to the study and memorization of a certain set of standard texts – in most cases the Five Classics 五經 – which led to an absorption of grammar enabling authors to naturally reproduce consistent patterns. This is of course a simplification of a much more complex phenomenon, but it stands in stark contrast to the linguists in India who cultivated and developed an extensive tradition of systematic linguistics, the most famous individual within it being Pāṇini who wrote the Aṣṭādhyāyī, a grammar of Sanskrit which became the standard by which future authors used as a standard. It seems that the traditional method of learning Literary Chinese was an osmosis of unidentified grammatical patterns rather than a systematic study of readily identified grammatical patterns. Here the character lùn 論 is identified as meaning “discourse” or “debate”. It states the pronunciation is derived from the right-hand element lún 侖. While both of these points are important, one might, at least from our present day perspective, ask why there is no mention if this is a verb or noun? The dictionary does not provide such categorization of words. There simply is no vocabulary for such things as verbs, nouns, prepositions and so on. Unlike in Sanskrit where the distinction between nominals and verbs is absolutely key and made clear, there is no attempt in this or other dictionaries from the same period to categorize words in such a fashion. Long before Chinese intellectuals ever knew of Latin grammar, there was exposure to a similar tradition from the neighbouring civilization of India. Now, to what extent was Chinese linguistics influenced by its Indian counterpart? 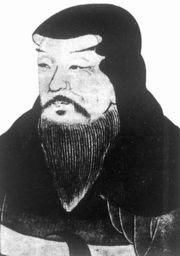 Shen Kuo 沈括 (1031-1095), an intellectual with various interests including Sanskrit, was aware even in his day of Sanskrit influences in Chinese linguistics. Consider the following remark from his work Dream Pool Essay 夢溪筆談. Shen Kuo makes reference to Sanskrit several times in the aforementioned work. It seems his interest was concentrated in Sanskrit phonetics which he utilized to further explain aspects of sounds in Chinese. * 依主釋 (Skt. tat-puruṣa) — dependent compound, in which the first noun modifies the second noun ('mountain temple'), or, e.g., 眼識 visual consciousness, where the eye is the qualifying term. Also written 依士釋. * 相違釋, (Skt. dvaṃdva) — a compound in which both elements are equal ('mountains and temples'). A term indicating two separate ideas, e.g., 教觀 teaching and meditation. * 持業釋, (Skt. karma-dhāraya) —a compound in which the first element is an adjective or adverb, and the second element a noun or adjective, respectively 'high mountain,' 'very high'. May also indicate two nouns in apposition, referring to the equality of dependence of both terms, e.g., 大乘 Mahāyāna, 'great' and 'vehicle', both equally essential to Mahāyāna with its specific meaning. Also written 同依釋. * 帶數釋, (Skt. dvigu) —a compound in which the first element is a numeral; 'five dharmas', 'five skandhas' 五蘊, etc. * An adverbial compound 鄰近釋 (Skt. avyayī-bhāva), or a term resulting from 'neighboring' association, e.g., 念處 thought or remembering place, i.e., memory. In India, a compound in which the first element is unchangeable; in China, this name is given to a compound in which one of the terms is used in a slightly altered meaning (the 念 in 四念處 should, properly speaking, be 慧 (prajñā), but since 念 (smṛti) resembles 慧 in its function, it is used in place of 慧 in this compound). Judging from when these terms first start appearing in the Chinese Tripiṭaka, it seems it was the great translator Xuanzang 玄奘 (602-664) who first translated and introduced these terms into Chinese. A few decades later Fazang 法藏 (643–712) was making use of these terms in interpreting Chinese lexical items and many more commentators who likewise made use of them were to follow. It is also to be noted that in the far west of China at Dunhuang 敦煌, a center for both trade and intellectual exchange, there was a cache of texts and paintings sealed in a chamber in 1002 CE and uncovered in the early 20th century. Besides the Chinese texts there were also texts written in numerous languages including Sanskrit. This is not surprising considering that to the west in Central Asia in the state of Kuci 龜茲, which was heavily influenced by Indian culture, monks read Sanskrit and the script was based on an Indian model with minor changes as Xuanzang reported.4 Inside the cave the text below, the Mahāyāna Mahāparinirvāṇa-mahāsūtra, was uncovered. This indeed shows that some individuals were familiar with Sanskrit and its grammatical terms. While these ideas may have had currency within Buddhist circles they were not adopted and employed in any significant way by non-Buddhist literati. It seems the aforementioned terms were really just used as jargon by Buddhist commentators. A lot more than this could be written on the subjects discussed above. However, as this is merely an exploration of the subject rather than a comprehensive study, I should conclude this blog entry here. The main thing I wanted to point out was that Literary Chinese never had a prescribed grammar as one would find in Hellenic and Indian linguistic traditions, and despite that the many authors over the centuries still managed to produce a coherent and functional written language that was employed across all of East Asia. I imagine this was mainly due to the semantics behind Chinese characters. The other relevant observation is that while China was exposed to Sanskrit studies and to some extent its grammatical vocabulary, it does not seem to have influenced intellectuals so much beyond Buddhists and pundit characters like Shen Kuo. This is of course based on my own opinions and observations. If I have made any errors or overlooked anything, I should hope readers will point it out. Shuowen Jiezi at Chinese Text Project - Digitalized and searchable edition. Dream Pool Essays 夢溪筆談 - Digitalized version of Shen Kuo's work. For references to Sanskrit search for the character fàn 梵.
Dunhuang Archive - Digital archive of many texts and relics. Shuowen Jiezi Dictionary and the Human Sciences in China by Francoise Bottéro and Christoph Harbsmeier - A good survey of the structure within the Shuowen Jiezi. Article published in Asian Major. 1 Pulleyblank, Edwin G., Outline of Classical Chinese Grammar (Vancouver: UBC, 1995), xiii. 3 Muller, A. Charles, ed. Digital Dictionary of Buddhism. . Edition of June 16/2011.